Cooler weather is on its way to the High Country. It is still warm enough to grill and eat on the deck, but I packed away my summer clothes tonight and have the hot tub cranked up and ready to go for the first really chilly night. And we are slowly transitioning from “summer food” to “fall food”. One of our fall favorites is this Smoked Chicken and Paprika Brunswick Stew. It goes together quickly, makes great leftovers and gets a satisfying serving of vegetables into the boys. In a Dutch oven over medium-high heat, cook the bacon until it renders some fat, then add the onions and cook until soft and just beginning to brown. Add the potatoes, corn, lima beans, tomato sauce and chicken broth. Bring to a gentle boil. Cover and reduce the heat to low. Simmer for 30 minutes or until the potatoes are tender, stirring occasionally. Stir in the chicken, paprika, salt, red pepper and black pepper. Simmer for another15 minutes. Taste, adjust the seasonings, and serve. 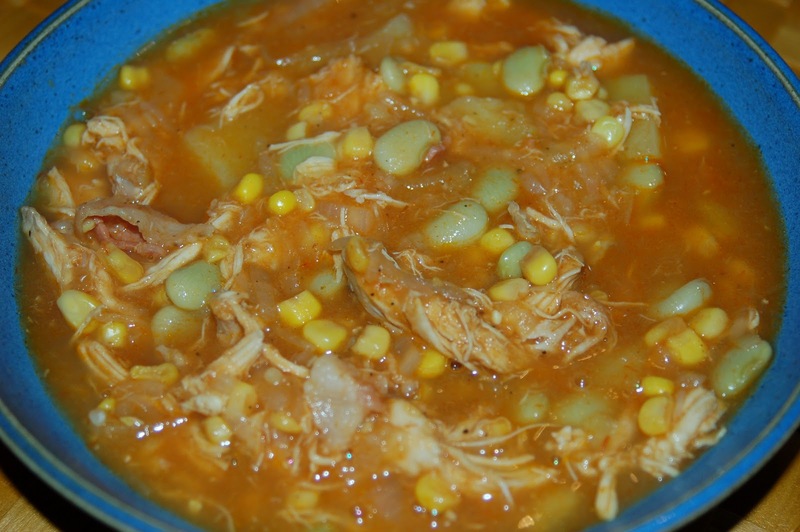 Brunswick stew is a traditional southern dish, with both Georgia and Virginia laying claim to its origins. The only time I recall eating it growing up in Mississippi, my Delta-based grandmother Mimi prepared it with squirrel meat. I am thinking that that is the only time I’ve eaten squirrel. 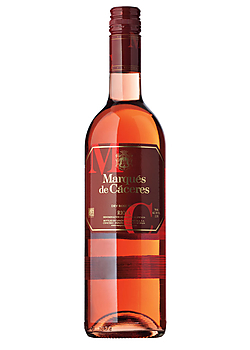 Smoky paprika is clearly not a traditional ingredient, but I love the flavor that it adds. This stew is based on one published a number of years ago in Cooking Light. The biggest, and most important, difference between my version and Cooking Light’s is that I use smoked chicken. When whole chickens are on sale, weather permitting, I buy several and throw them on the smoker, then debone and freeze the meat. I’ve also moved the smoker box on to a corner of the grate and smoked the chicken on the gas grill. With smoked chicken in the freezer, I typically have all the ingredients to throw this together on hand. Corn bread muffins are the perfect side. My boys are both in high school now, and both are running cross-country. My older son is driving now so the two of them leave the house around 7:45 in the morning and are gone until 6:30 or 7:00 in the evening. I am hearing faint whisperings of an empty nest. At first I felt a bit at loose ends, but then I remembered how much I relish time home alone. And in the past few weeks, several tasks that have lingered on my to-do list for an absurdly long time have finally gotten done. I had hoped that if I ignored that stuff long enough it might go away but apparently the IRS had no interest in cooperating. Family dinner is more important than ever. Warren Buffett is constantly begging to watch New Girl during dinner but I resist. We talk about school, all the crazy politics these days, Warren Buffett’s latest plan to make a million dollars. I tell them goofy stories about my students, correct their table manners and insist they eat their vegetables. They make me laugh. They make each other laugh. And then we watch New Girl. 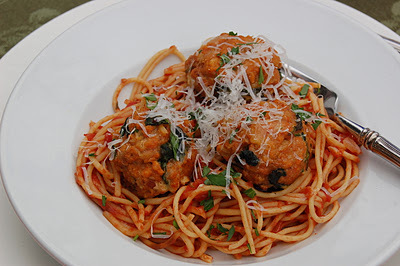 This recipe for chicken meatballs with pasta and a pomodoro sauce served with a green salad is a perfect family dinner — lots of carbs and protein for the athletes. The meatballs can be a do-ahead or a chance to drag the kids into the kitchen and put them to work. It is a versatile meal– skip the meatballs and go vegetarian or skip the pasta and go low carb. Make a double batch of the chicken meatballs to use in meatball subs for a later meal. I freeze them before baking, but you could also bake and freeze, then rewarm in the sauce. Put a large pot of water to boil for the pasta. Warm the olive oil in a medium non-stick skillet over medium-low heat. Add the onion and cook, stirring frequently, for about 10 minutes until it softens and begins to brown. Add the spinach to the skillet and cook for about 3 minutes until it is wilted and any water has evaporated. Add the garlic and cook another 1-3 minutes. Remove the skillet from the heat and let the vegetables cool. In a medium bowl, combine the chicken, bread crumbs, cheese, egg, tomato paste, salt and pepper. When cool, add the vegetables and stir to combine. Stir in the milk, adding it sparingly. Roll the chicken mixture into 12 golf ball-sized meatballs and place them on the cookie sheet. Bake for about 20 minutes or until the internal temperature is at least 165 degrees. Wipe out the non-stick skillet and heat the 1/4 cup of extra virgin olive oil. Add the minced onion and cook for about 10 minutes until it softens and begins to brown. Add the garlic and cook for 1-3 minutes. Increase the heat to medium and add the crushed red pepper flakes, tomatoes, basil puree, pepper and 1/4 teaspoon salt. Cook the sauce, stirring occasionally, until it thickens, about 20 minutes. Add the 1/2 teaspoon salt to the pot of boiling water then drop in the pasta. Cook the pasta according to package directions until it is not quite tender (about 2 minutes less than the prescribed cooking time). Drain the pasta, reserving about 1/2 cup of pasta water. Turn the heat up to medium high and stir the pasta water into the sauce to loosen it. Bring the sauce to a boil and stir in the drained pasta, continuing to stir until the sauce coats the pasta and the pasta is al dente. Serve the pasta in shallow bowls. Top each with 3 meatballs and a sprinkling of Parmigiano Reggiano and parsley. For a couple of summers now, I’ve suggested that my boys (now 17 and almost 15) start learning how to cook. This summer, out of necessity, I’ve given them no choice. Over the past year, when I’ve been too busy or tired to make dinner, I’ve summoned them to the kitchen and insisted they stay until dinner was on the table. Ice-T, my older son, is learning how to grill. With the help of a meat thermometer, he can cook a flank steak to medium rare perfection. He can make french toast, rice, waffles and grilled cheese sandwiches. Warren Buffet, my younger son, understands the basic composition of salad dressings and marinades, fries bacon and makes guacamole, blueberry pancakes with orange honey butter, and brownies. All those years of watching Top Chef are clearly paying off! Over the past couple of months, there have been several nights when I was busy with freelance projects and had absolutely no time to cook. I had planned and shopped though, and saw no reason to order pizza (not that any places deliver to my address anyway). Their first joint cooking project was a chicken and asparagus stir fry served over rice. I keep Gourmet Garden tubes of garlic, ginger and a couple of herbs on hand for times when I am trying to throw together a dressing, marinade or stew in a hurry. This cut down on the kind of chopping that might make me nervous. The asparagus was easy to slice,. The guys received extensive instructions on the proper handing of chicken (during which they announced that their dad and my mother each thought I was a little neurotic on this topic). Dinner turned out really well. Whenever one kid is gone and one is home, I tend to scale back on cooking, While Ice-T was in the mid-west sailing and having a great time at engineering camp earlier this month, I was super busy teaching a course while updating my teaching materials, spending time on research, and working on freelance projects daily. Warren Buffet was thrust into the role of chef and, more or less, rose to the occasion. One night, he mixed up a marinade for chicken breasts, put together a Greek salad including the dressing, and made tzaziki sauce with me providing instructions from the next room. Another night, he made his blueberry pancakes with cinnamon-maple syrup and orange-honey butter and bacon with little maternal guidance. 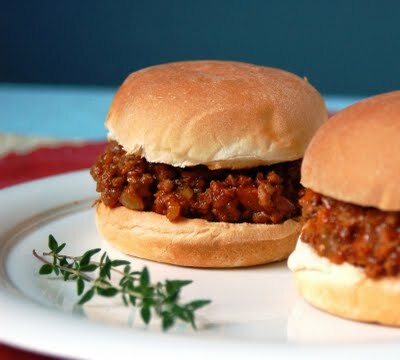 His third dinner that week was these sloppy joe sliders, made with ground turkey and loaded with vegetables. * After you grate the zucchini, wrap in a paper or kitchen towel and squeeze out any excess fluid. Brown the meat in a large non-stick skillet over medium high heat, using a spatula to break it up. When you are sure the meat is thoroughly browned, dump it in a colander to drain the extra fat. Wipe out the skillet, and heat the olive oil over medium heat. Saute the onions, celery and carrots until the vegetables soften, about 5 minutes. Add the zucchini to the skillet and saute until any moisture has cooked off, then add the garlic and continue to cook for 2-3 minutes. Dump the meat back into the skillet, add the salt and pepper, and stir to combine. Then, add the ketchup, tomato sauce, Worcestershire sauce, red wine vinegar, brown sugar, hot sauce and thyme. Stir to combine. Stir in 1/2 cup beef broth and simmer on low heat for 20-30 minutes. Toast the slider buns. Top each bottom bun with the meat and top bun. This is a great dish for teens to learn to make. It’s filling, nutritious, comfort food and way better for them than processed frozen stuff. It is inexpensive and can easily be doubled or tripled and frozen. The leftovers always get eaten! I don’t have a nutritional analysis of a serving of these sloppy joes, but I tell myself that each diner is surely getting at least a cup of vegetables so that a side dish is not absolutely necessary. If you’re not buying it or want a fresh side with a contrasting texture, try my broccoli- apple slaw or crunchy broccoli salad. Or you could just have some potato chips.